The Sphygmomanometer is the diagnostic device used to measure the blood pressure. Blood pressure is the pressure exerted by the blood on the wall of the artery during its flow. It is meant for keeping constant blood flow throughout the body irrespective of the position. Normal blood pressure is 80 mmHg-120 mmHg in which 80 mmHg is the diastolic pressure when the heart relaxed and 120 mmHg is the systolic pressure when the heart contracts. The diastolic pressure up to 90 mmHg and systolic pressure up to 130 mmHg is treated as normal but the person is in the border line of Hypertension. Usually a BP index is used since the BP may vary slightly depending on the conditions of the body and either systolic or diastolic pressure may be high as in the case of aging. Even if we sit in front of the Physician, our BP may increase slightly due to nervousness, a condition called as “White coat effect”. BP index is calculated by adding systolic and diastolic pressures and then dividing by 2. In normal case it is 120+80 / 2 = 100. Up to 110 is treated as normal. BP measurement on both the arms and periodic measurement are advisable to confirm the Hypertension before going on medication. 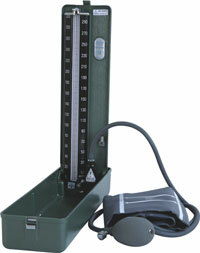 Conventional Sphygmomanometer is mercury column based and has an inflatable cuff to restrict the blood flow. It is used in conjunction with Stethoscope to hear the sound during the measurement. Sphygmomanometer was invented by Samuel Siegfried Karl Ritter von Basch in 1881. The Sphygmomanometer consists of an inflatable compression cuff, a bulb for pumping air and a mercury based measuring unit. The unit of measurement is millimeters of mercury, mmHg. The cuff is placed smoothly and snugly around the left upper arm at roughly the same vertical height as the heart. During BP measurement you should sit on a chair with back supported, feet flat on floor, sleeve rolled off and fore arm supported by the physician at your heart level. The physician then wraps the cuff around the upper arm and squeezes the bulb to inflate the cuff. Then the air in the cuff is slowly released, which gradually deflates the cuff and lowers the pressure that constricted the upper arm. Meanwhile, the physician, listens the sounds from the brachial artery in the elbow using a stethoscope. Systolic pressure is indicated by the first sound heard (a pounding sound) in the stethoscope as cuff deflates. Diastolic pressure is the point at which the sound disappears.